The market is full of pumps, giving customers a dizzying array of choices. Analogue or digital, minimal emergency pump or workshop edition, the affordable basic product or the luxury model? Everyone has different ideas of what they need, but there are some fundamental requirements such as efficiency, ease of use and accuracy. The winner in this shootout has to fulfil these, as well as offering a reasonable pack size and remaining affordable. Our test field is divided by size into three groups. However, we did not differentiate between the sizes when testing, but instead evaluated the advantages and disadvantages of each individual pump. For most of us, models like the SKS USP or the RockShox 600 psi are simply too big or too heavy to fit in a backpack, but thanks to the large pump volume they’re noticeably more comfortable to use in the workshop. 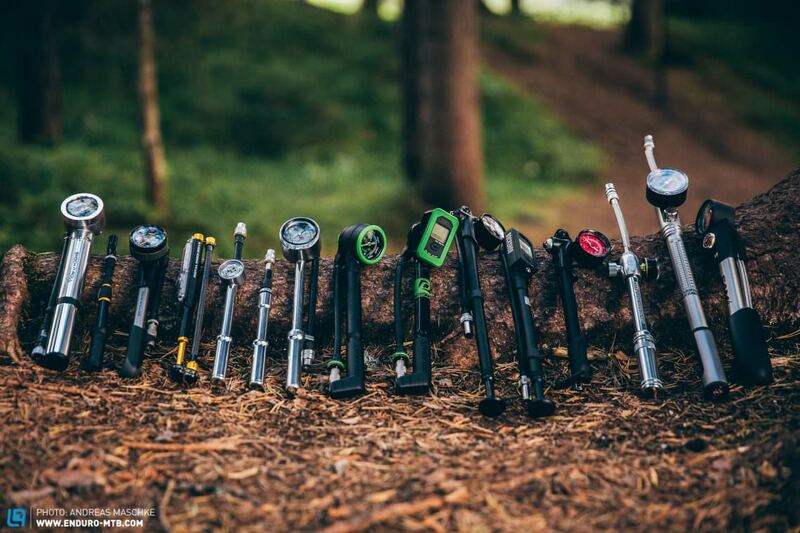 Small models such as the Topeak Microshock or Birzman’s Macht and Zama are intended more for emergencies on the trail – some don’t even have a gauge. On average, they require twice the number of strokes and so aren’t suitable for initial setup or more extensive tuning. They do take up very little space and stow away inconspicuously in your backpack though and one of these small models performed surprisingly well! The rest of the test field is what we would define as “standard size” including some of the most popular pumps available on the market. 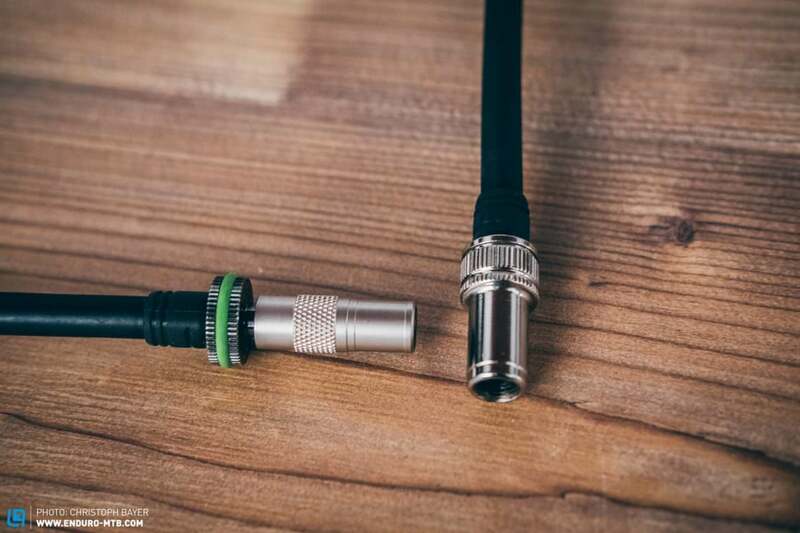 One of the more unique contenders we included in the test field is Topeak’s Shock ‘n Roll. It’s a combination of shock and tire pump and you can switch between modes with a simple twist. Why is brand XYZ not included?? As with bike group tests, some models were not available at the time of testing, or manufacturers didn’t want to include their products in the test. In the case of shock pumps, few brands even design and produce their own. Whether the label says FOX, RockShox, DT Swiss, Cane Creek or the like, it is often the same rebadged pump from the same factory in Asia. 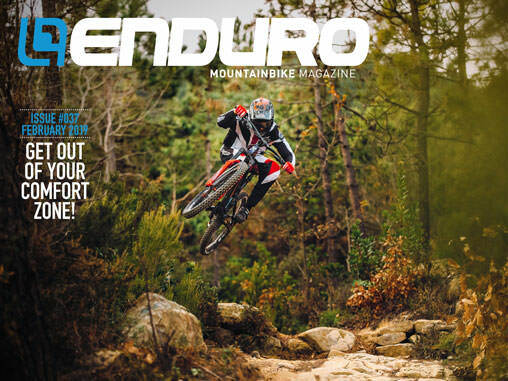 RockShox’s three models are representative of this category. To the best of our knowledge, all other brands in the test field manufacture their own pumps or at least have exclusive models offered only by them. What and how did we test? To determine pump accuracy, we created a very simple test. 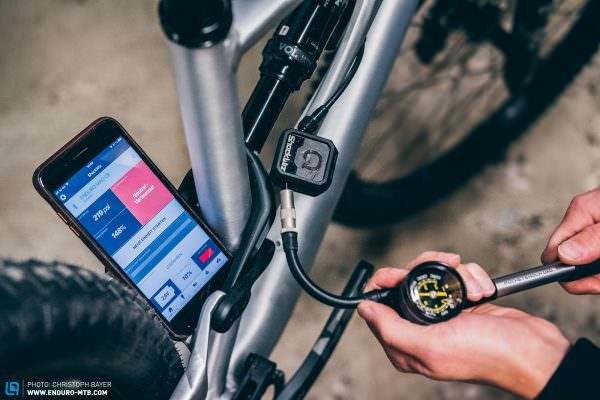 We installed a Quarq ShockWiz between the fork/shock and the pump, displaying the live readings on the app. This allowed us to compare the recorded pressure with the display on the pump itself, as well as measure the pressure equalisation when attaching the pump. Next, we counted the strokes needed to reach a specific pressure on the ShockWiz and noted the deviation on the pump gauge once we reached that pressure. We’re aware that a ShockWiz can’t replace high-precision laboratory equipment, but standard pump gauges can’t either. Added to this, gauges are susceptible to manufacturing variations which can influence both accuracy and precision. Accordingly, we were primarily on the lookout for abnormalities and outliers rather than super exact readings. What we found is that all SKS pumps have a very accurate gauge, whilst the Lezyne, Birzman Salut and analogue Syncros pump showed the biggest deviations. There are other factors that are crucial in determining a good pump though. 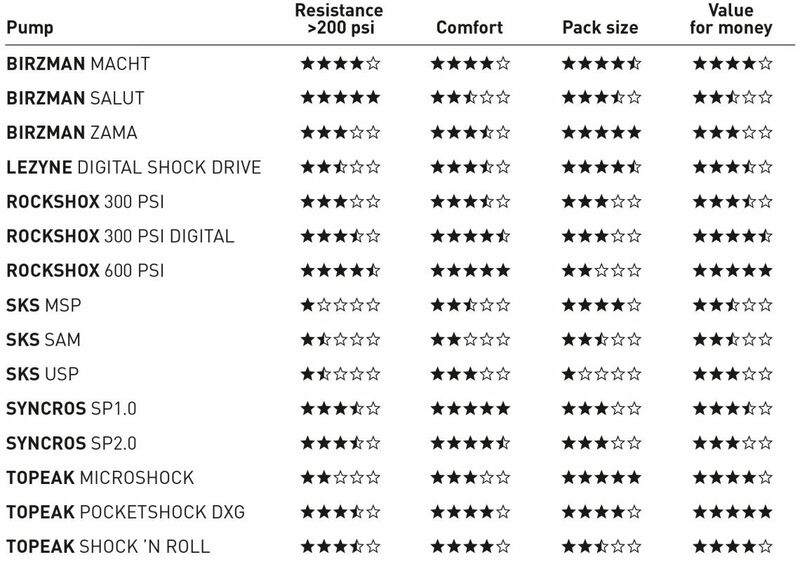 For a shock pump to be good, it needs to be user-friendly. We tested the pump head for ease of use and compatibility – a big chuck won’t fit in every frame. Besides that we were also concerned with the general handling – how many steps does it take until the pump is ready to use and how much resistance does it exhibit at the high pressures you typically run in a shock? The price is just as relevant; not everyone wants to invest € 75 in a shock pump if you only use it a few times a year. Lastly, weight and dimensions play a role, as riders will most likely want to carry the pump with them in a backpack or hip-bag. Unfortunately, due to the duration of the test, we can’t make a comprehensive statement about the durability and reliability of the tested shock pumps and can only rate the performance during the six month test period. Deciding between a digital or an analogue display is mostly a matter of taste. Pumps with digital displays score with better readability and more compact dimensions, but are usually a bit heavier, more expensive and require batteries. In addition, the options available on the market are very limited. Pumps with an analogue display are cheaper, lighter and don’t need batteries, but depending on the model they’re a little more difficult to read, more susceptible to physical impacts and they take up more space in a backpack. How important is accuracy anyway? If you always use the same pump, in theory, precision is the most important quality and you needn’t worry about the accuracy of the pressure reading on the display, as long as it’s the same every time. 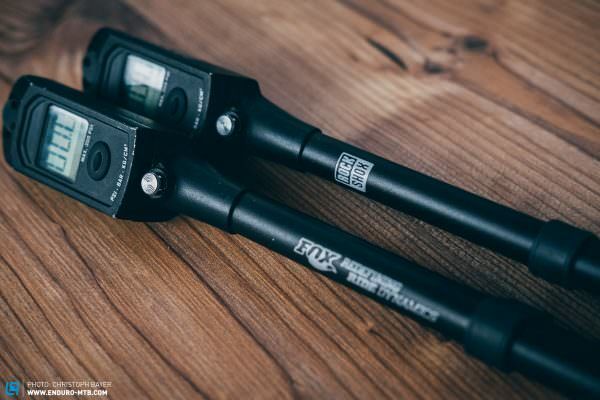 However, there is a small catch – you won’t be able to use manufacturer recommendations such as the pressures RockShox and FOX display on their forks, for example, or Cane Creek provide online with an inaccurate display. You won’t be able to compare your setup with others either. It goes without saying that forks and shocks lose some pressure when the pump is screwed on as the pressure distributes itself over a larger volume. This effect increases with higher pressures. 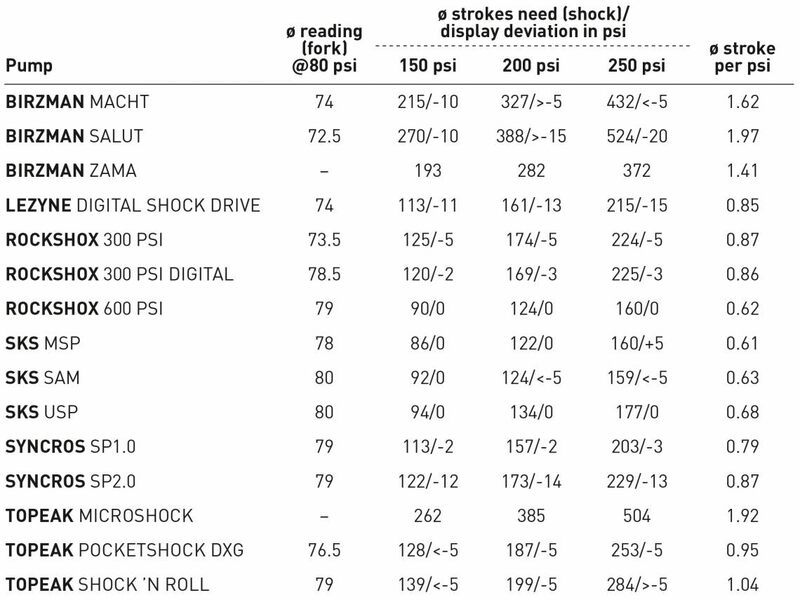 It was 2-3 psi on average with our test shock at 100 psi and 8-10 psi with it at 250 psi, using the standard-sized pumps. The myth that the fork or shock will lose pressure as soon as you unscrew the pump head is still propagated on mountain-bike forums. In actual fact, not a single pump does that, as our test with the Quarq ShockWiz showed. It doesn’t matter how slowly you unscrew the pump or whether it has a manual check-valve – which incidentally exists purely because of this myth. Interestingly, some pumps (Syncros, Topeak) may experience pressure loss due to operator error from that same valve control system. If you don’t unscrew the knurled control ring far enough before unscrewing the head, you will indeed lose some pressure. But operator errors aside, we’ve been able to demonstrate that no pump causes pressure loss when you unscrew the head. 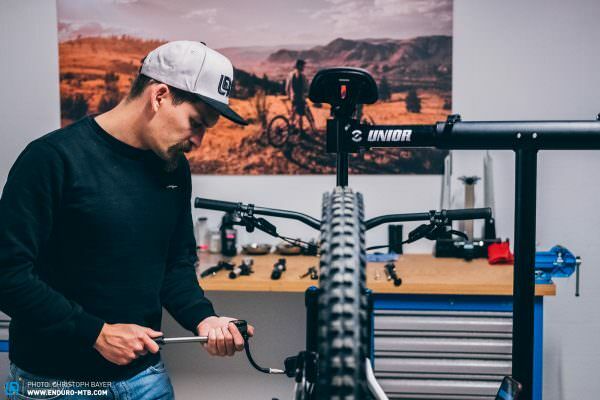 If you pump up 20 forks a week in your workshop, RockShox’s 600 psi pump may be the best choice due to its huge volume. If you want something as compact as possible, but not at the cost of comfort, we recommend the Birzman Macht. We were very disappointed by all of the SKS pumps, although they do have the most accurate pressure gauges. However, handling, ease of use and quality left a lot to be desired and the nice looking aluminium models above left us with feeling like they were “all bark and no bite”. 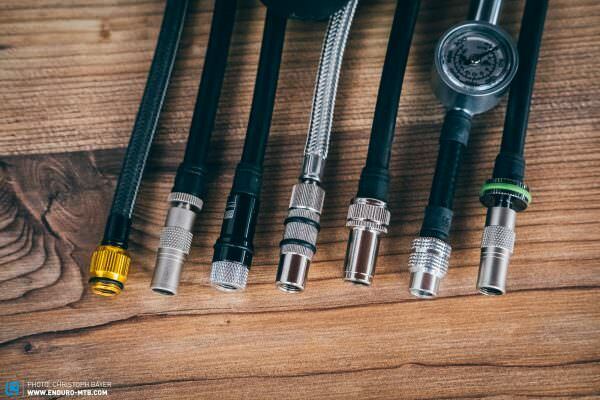 Two pumps made it into the final round of the hotly contested middleweight title for the best all-round shock pump, and although they couldn’t be more different, it was almost a tie. 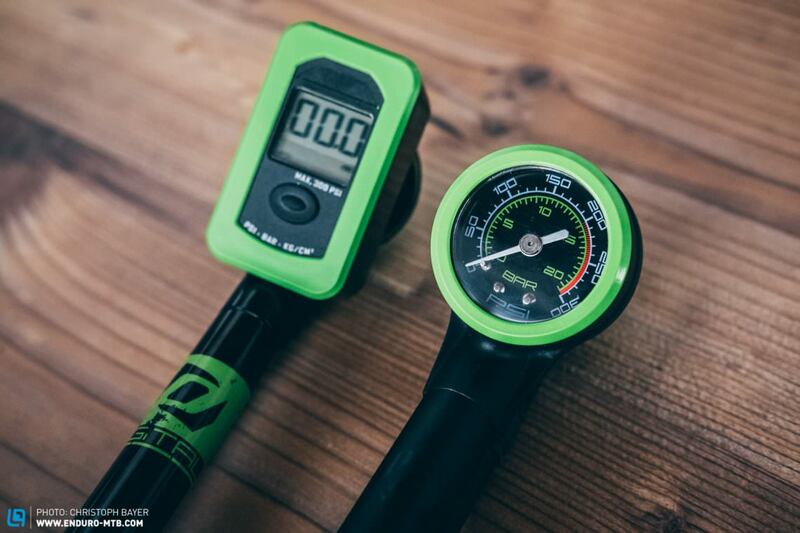 RockShox’s 300 psi digital model is a proven, easy-to-use pump that offers reasonable output with medium effort with an easy-to-read, accurate display in a sleek design. Unfortunately, it is a little too long to stowe in a backpack, requires a battery and at € 73, it isn’t exactly cheap. Topeak’s Pocketshox DXG, on the other hand, scores well here. At € 39.95 it’s the cheapest standard-sized pump in the test field, has a small pack size while delivering a convincing performance with a user-friendly and analogue display that is accurate and easy to read. 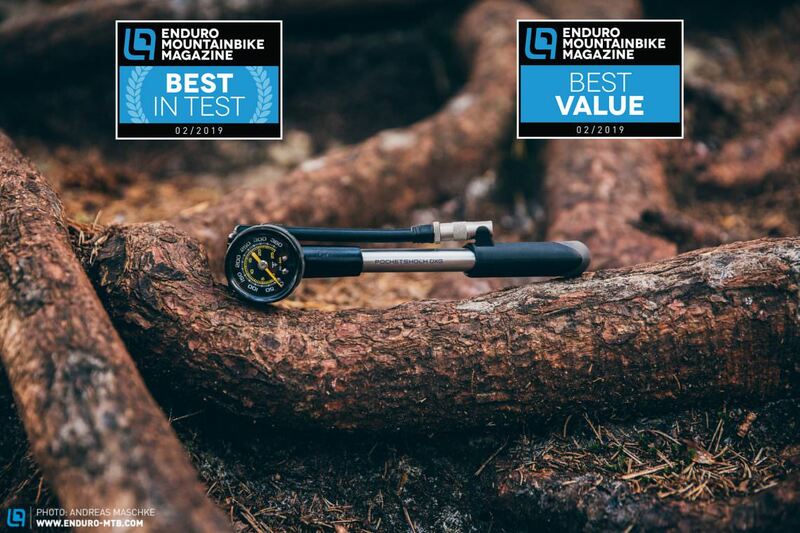 Thus, the Pocketshox DXG secures both the Best in Test as well as the Best Value Tip of this group test! Most of the time you can find Andi in front of his screen working on the next issue for you, or in the workshop preparing the bikes to be tested. Once in a while, he tests as well - thorough that is.